Ladders are one of the most commonly used tools in the workplace. 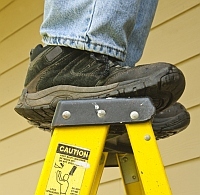 While it may seem obvious how to use a ladder, ladders can be dangerous. Each year over 300 people die in preventable ladder falls. Make sure your team knows how to properly use a ladder to help avoid ladder accidents and injuries.